…so I find myself just hanging around the house this fine Florida Sunday afternoon, and thought it was about time to do another review. I went to the humidor and pulled out a cigar I have tried several times and with which I seem to have developed a strong love/hate relationship. I selected the CAO OSA Sol, in robusto (5X50, and marketed as the “Lot 50”). I have tried each of the three vitolas this line is currently offered in, and to my palate, the Lot 50 has been the more flavorful of the three. It’s also the only size OSA I had on hand, so that made the choice rather obvious :). 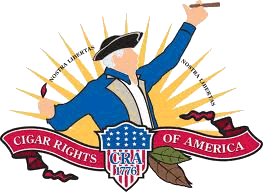 This is the first release from CAO after the change in ownership to General Cigar. 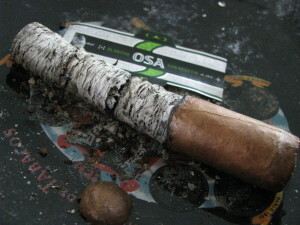 According to General, the cigar features the Olancho San Agustin (OSA) wrapper, grown in “one of the most fertile and rich valleys in Honduras.” The binder is Connecticut, and the filler is a blend of Nicaraguan and Honduran tobaccos. In Tampa, it retails for about $3.75 per stick by the box, and $5.50 for singles. Pre-light, both the foot and wrapper produce a mild woodsy aroma, slightly sweet but not overtly so. The draw is firm but unencumbered, and produces more of the sweet wood and leather noted in the scent. In terms of appearance it is a beautiful cigar. The wrapper leaf shows a few slender veins, and is dry to the touch – although very pliable and supple. I don’t detect any uneven spots along the stick; the bunch seems uniform throughout, with possibly a slightly dense area about 1/2″ from the foot. The feel and draw leads me to believe the cigar is quite well constructed. Upon initial light, the most remarkable thing is the copious amounts of smoke that this cigar is generating. The first blast of flavor is very spicy on the back of my palate and throat. It is more felt than tasted; I would stop short of calling it peppery in taste, but it produces the distinct feeling of pepper on the palate. The retrohale is aggressively spicy in this respect, but I find that often within the first few minutes of many cigars. As I progress through this first inch of the smoke, the flavors almost make it over the hump into some citrus or cedar…but not quite. There is a slight perceived bitterness, which could honestly be produced by the dryness of the smoke. Within the first five minutes of lighting, I was reaching for my ice water to relieve that dry feeling. This dryness continues throughout much of the cigar. Toward the final puffs of the first inch, and into the second, the flavors do progress into the citrus family I mention above, but the wood remains. It flirts with the citrus, but doesn’t commit. The spice has subdued by this point, but is still present. Had these flavors come through stronger, I might have compared them to other sticks I have had that include a bit of Brazilian tobacco – I always get a clear perception of citrus whenever that is the case. I would place this in the same family of flavors, but not prominent in this case. There is also a noticeable presence of a somewhat off-putting “ashy” flavor as well. During this time, the burn became a little cockeyed, but stayed reasonable with only a couple of minor touchups. It continued to produce a great deal of smoke. This smoke production and the accompanying rate of burn dictated a very slow cadence. It pays to widely space your puffs with this cigar. It never even pretended to go out, even with only occasional draws. The third inch of smoking has confirmed the earlier hunch about construction. I find no fault there at all. It has burned exceedingly well, and never wavered in the easy draw mentioned earlier. By this point, the flavor and spice has mellowed a good bit, with the woodsiness and citrus finally coming into their own. In fact, by the final stretch, the spice has all but abated. 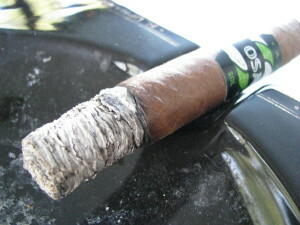 The ashy taste has definitely become more pronounced, however, signaling the end of the cigar. As I mentioned at the outset, I have developed a love/hate relationship with this blend. I have had each of the sizes, and probably about 7-8 of the blend total now. To be honest, had I judged solely on the first example I smoked I would probably have been willing to purchase a box of them. After subsequent smoking, however, I don’t think I would. 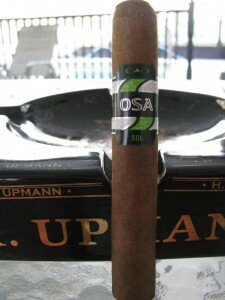 The cigar itself is a solid smoke, just not for me to keep around in large quantities. The construction has been outstanding for each of the sticks I have smoked, and the burn has been exceptional in most cases. The flavors, however, just haven’t been my cup of tea. Some have been great, straying further into the citrus and cedar, while others have been ashy and bitter in comparison. This inconsistency has been a drawback for me. I certainly would not hesitate to buy a few more and keep them around for the occasional diversion. In fact, I will probably do just that and sample them as time progresses. But, I don’t foresee purchasing a box of them any time soon. I would absolutely recommend trying them…but I would not recommend investing in a box without going through several first.